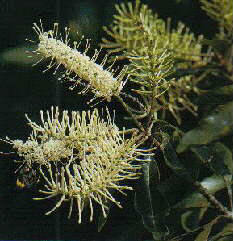 This silky oak species is endemic to the wet tropical rainforests of Queensland, as are the Northern Silky Oak and Ivory Curl Flower. It has extremely durable wood that was once of major value to the timber industry. Silky oak trees can grow to about 30m and have dense crowns of large leaves which bear clusters of creamy nectar-rich fragrant flowers borne on long spikes. This photograph shows a Common Jezabel butterfly sipping nectar from the flowers.